Gladstone Healthy Harbour Partnership Chair Paul Birch releases a fortnightly column to The Gladstone Observer, The Advocate and Gladstone News Weekly. Environmental values (EVs) and water quality objectives (WQOs) for Capricorn-Curtis Coast region waters (including Gladstone Harbour), finalised in November 2014, are now included in Schedule 1 of the Environmental Protection (Water) Policy 2009—the EPP Water. View the final scheduled EVs and WQOs and map plans for the Capricorn-Curtis region. Consultation on EVs was carried out from 2012 to 2014, including public release of draft EVs and WQOs in 2014. The Fitzroy Basin Association worked collaboratively with the Department of Environment and Heritage Protection in developing EVs for the Capricorn Curtis Coast region waters. Figure 1: Capricorn and Curtis Coast region waters map (PDF, 729K)*. The waters include: the Styx, Shoalwater and Water Park Creek Basins, Keppel Bay, the Boyne, Calliope and Curtis Island Basins, including Gladstone Harbour, the Narrows, lower Fitzroy estuary and adjacent Great Barrier Reef coastal waters. The Gladstone Healthy Harbour Partnership (GHHP) launched their Pilot Report Card on the December 4 2014 in the Leo Zussino Building at Central Queensland University. The Report Card is a culmination of 12 months of work by the Partnership that reports on the environmental, social and economic health of Gladstone Harbour. 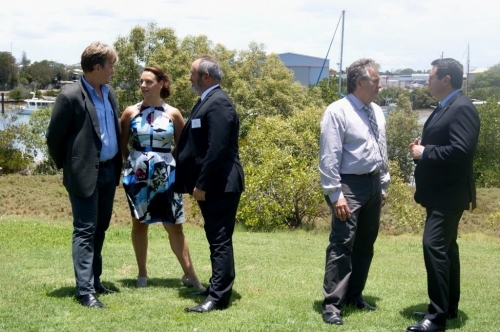 The GHHP launch played host to industry, government and community representatives as well as dignitaries including Minister for Environment and Heritage Protection Andrew Powell, Member for Gladstone Liz Cunningham and Gladstone Mayor Gail Sellers. Overall, the Pilot Report Card results indicate that environmental health of the Gladstone Harbour is a ‘C’, social health of the Gladstone Harbour is also a ‘C’ and the economic health of the Gladstone Harbour is a ‘B’. Environmental results vary across the Harbour Zones with the best results appearing in the Inner Harbour and the worst results in Auckland Inlet. The launch of the Pilot Report Card was followed by a Community Consultation Session run by GHHP where various representatives from community and environmental organisations were presented with details of the grades and findings. The Gladstone Healthy Harbour Partnership is seeking feedback from the community and stakeholders on the 2014 Pilot Report Card to improve the reporting process for the final version in 2015. Visit the GHHP website to view the Gladstone Harbour 2014 Pilot Report Card and to have your say, go to www.ghhp.org.au. Gladstone Healthy Harbour Partnership are seeking proposals to develop a Citizen Science project with a focus in the Gladstone Harbour catchment (where there are information gaps and outside the current GHHP science projects scope), with community volunteers trained to undertake monitoring of the waterways and other natural resource management activities such as (riparian plantings, litter clean ups, community stormwater education, fish monitoring). Further information can be found in the below scope of works. Gladstone Healthy Harbour Partnership will be launching their ‘Our Harbour Our Reflections’ project on the 24th of October. See the invitation below for full details. The Gladstone Healthy Harbour Partnership (GHHP) has released the first edition of ‘Harbour Focus’, a quarterly newsletter detailing activities of the partnership. The Gladstone Healthy Harbour Partnership and Elevate Media are excited to be working together on discovering the unique history of the Gladstone Harbour, collating the information and interviewing local people to tell their stories in recorded oral histories and digital stories. We welcome nominations for potential video interviewees and/or information about the history of the harbour. To check out the videos that have already been completed head to the Our Harbour, Our Reflections website. The Gladstone Healthy Harbour Partnership launch was held on 6 November 2013 at the Gladstone Marina Parklands. 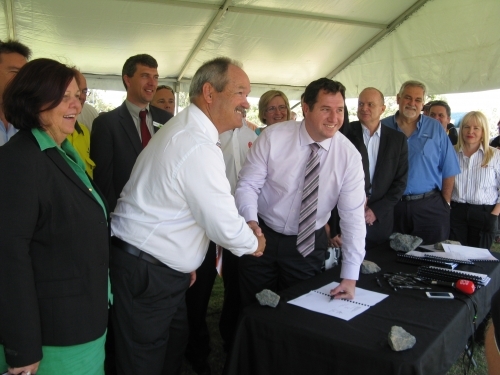 Representatives from the Gladstone community and GHHP Partners attended to sign a Memorandum of Understanding (MOU). The MOU outlines Partners’ commitment to work together to achieve a more comprehensive understanding of the relationships and interdependencies between the environmental, economic, social and cultural health of Gladstone Harbour. The MOU also talks about ensuring ongoing and timely communication with the Gladstone community about the health of the Gladstone Harbour through an annual report card. Honourable Andrew Powell MP, Minister for Environment and Heritage Protection (right) shaking hands with Mr Paul Birch, Chair of GHHP (left) at the signing of the GHHP memorandum of understanding. Following the signing of the MOU, the Partnership was launched. Aunty Jackie Johnson welcomed the launch attendees to country alongside Ms Lee-ann Dudley. Ms Jessica Johnson performed ‘Wungyunga’. Wungyunga is a traditional welcome song in Gooreng Gooreng language. Aunty Jackie Johnson (right) welcomes launch attendees to country alongside Ms Lee-ann Dudley (left). Following that, Mr Paul Birch, Chair of the Partnership, outlined his thanks to the partners for their hard work over the last 12 months. He also referred to the Gladstone Healthy Harbour Partnership’s vision of a healthy, accessible, working harbour. The last speaker of the day was the Honourable Andrew Powell MP, Minister for Environment and Heritage Protection. Minister Powell talked about the future of the Partnership. He said that the most important principle of the partnership was open, honest and accountable reporting of Gladstone Harbour’s health to Gladstone, Queensland and international communities. Gladstone community members and Partners at the launch of the Gladstone Healthy Harbour Partnership. 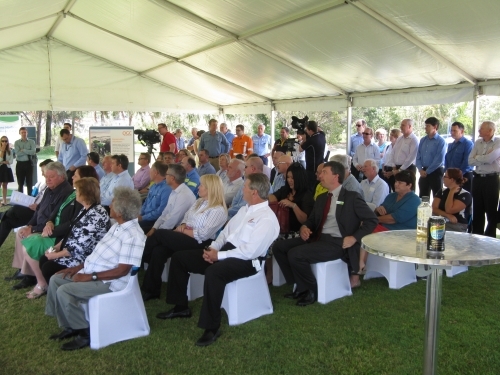 The launch concluded with a morning tea for the community, industry, government and research partners.